My most recent blog post was meant to be a warning to everyone thinking of installing a watchOS beta open their Apple Watch. In short, mine was rendered completely unusable and I had to take it to the Apple Store to be fixed. They couldn’t;t fix it in store, so they sent it to headquarters. My watch was messed up on Friday, I brought it to Apple on Monday, and I got it back from them this Friday. All in all, I’ve spent about a week without a functioning Apple Watch. Here’s what I’ve learned. My big takeaway is that the Apple Watch is a bigger part of my life than I had realized before. I know, I know, I’m the “Apple Watch guy” but I didn’t truly realize just how much I relied on this little guy until I lost it. I noticed the lack of media controls when driving. Needing to grab my phone and use the controls there to skip tracks or to navigate a podcast episode is not only frustrating, but it’s dangerous. With the Apple Watch I just need to tilt my wrist slightly and tap the action I want. It’s much easier and MUCH safer. I realized how stupid it feels to have to find your phone and turn it on to see the current time. I learned how goddamned barbaric it is to have to find and look at your phone to see notifications as they come in. My god, keeping track of my appointments and miscellaneous notifications while I was at work this week was a major pain. I know this is how most of the world interacts with their smartphones, but it feels so wildly inefficient compared to what I’m used to. I miss the Activity and Workout apps dearly. I missed being about to fill my rings, which it turns out is indeed a very effective way of keeping me on track. The Workouts app, which is only available on the Apple Watch, was also missed, as I don’t find phone-based apps as enjoyable to use. Similar to the notifications and time examples above, it’s just a pain to have to get my phone out of my pocket, unlock it (probably with a passcode, since my sweaty fingers don’t agree with Touch-ID) and check my status. Again, having that info directly on my wrist is wonderful. Losing the ability to say “Hey Siri, start a 5k outdoor run” and start running is way better than the way you start a workout in any app on the iPhone. I missed having such easy access to the weather. I have a complication on my watch face that shows the temperature and forecast info at all times. This means no matter where I am or what I’m doing I always have immediate access to the current weather and know if I need to bring an umbrella. Widgets mad this a lot better in iOS 10, but it’s still a matter of grabbing my phone and swiping over on the lock screen to access it. I missed unlocking my Mac with the Apple Watch. This feature could stand to be a little faster, but like everything else I noticed this past week, I really do miss it once it’s gone. My Mac’s password isn’t terribly long, so it’s not a horrible headache, but I definitely felt the pain of entering it over and over again. Lifting the lid of my laptop and then having it unlock itself a second later is pretty damn nice. 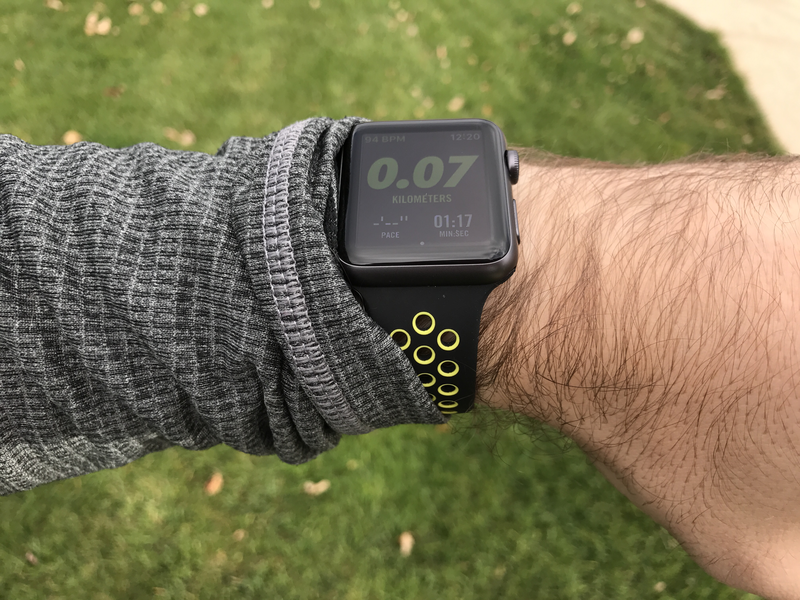 I missed wrist-based timers. Sure, I live in a home with Siri, Alexa, and Google Home, but I don’t find any of them as convenient as being able to toggle one quickly from my wrist. I have a complication on the watch face to set them if I want to do it silently, and I can say “Hey Siri, set a 15 minute timer.” Yes, I can ask those other assistants to do it too, but they’re not always around, like when I’m in the laundry room or when I’m not at home. There are more little things, but I think I’ve made my point already. As I have said many times, the Apple Watch is not for everybody, but for many people it is an essential tool. I use my watch hundreds of times per day and it makes a sizable impact on my life. Hello, Apple Watch, it’s good to have you back!